The King Of Fighters XIV comes to the Americas on August 23, developer SNK Playmore has announced. It was confirmed just last week that the fighter would be published outside of Japan by ATLUS, and – at least for now – will only be released on PlayStation 4. The release date was confirmed in yet another gameplay teaser trailer published on Sony’s PlayStation YouTube account earlier today, and gives fans another look at several of the playable characters on offer. Ladies and gentlemen, 50 fighters are ready to meet in The King of Fighters XIV, coming August 23 on PS4! While preserving the classic 2D gameplay and three-on-three team battles that made the King of Fighters series popular, The King of Fighters XIV brings a fresh change to the series with full 3D visuals. It also includes a wide variety of multiplayer and online features for the best King of Fighters experience yet! What, you thought that character number was a typo? No, there really will be 50 playable characters in The King Of Fighters XIV, so yeah… have fun testing them all out to see which one best suits your preferred playstyle. You can head through here to the blog post to read about all of the new features that will ship with the game. 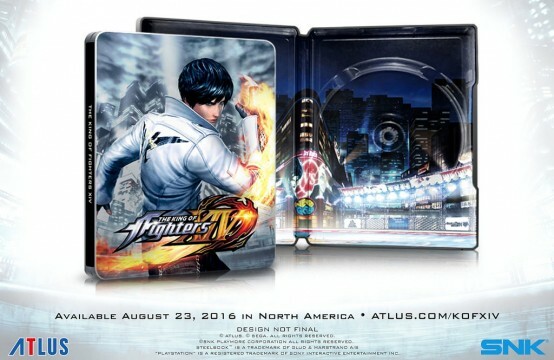 Oh, and before we forget, Hardin also revealed that pre-order/day one physical copies of The King Of Fighters XIV will also ship in a special, commemorative steelbook case, featuring art work of popular character Kyo. Is this the fighting game of 2016 you’ve been waiting for, or are you opting instead to wait for Tekken 7 to release on PlayStation 4?